I’m collaborating with the Foiled Fox team today so you can read more about these cards on their blog. These are my first cards created with Art Impressions ‘Watercolor’ stamps. The stamps are designed for creating scenes; there are a lot of little stamps depicting stems, branches, foliage and flowers. 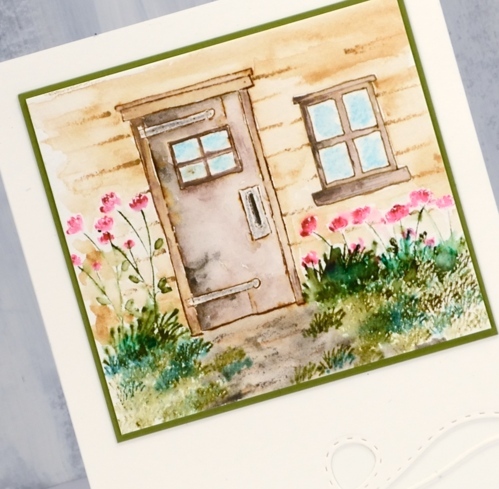 The stamper can combine them however they wish, use a water soluble ink then blend with a little water to turn all the stamping into ‘watercolor paintings’. 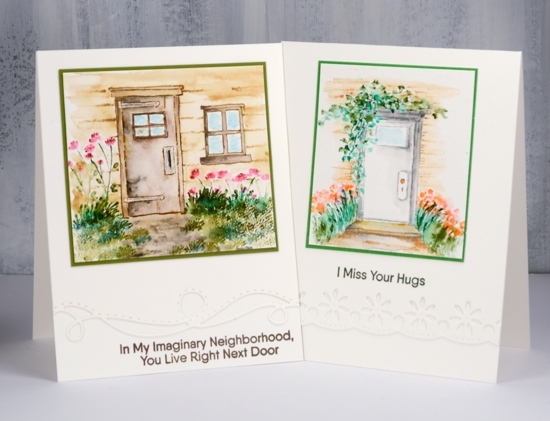 I used a combination of foliage and flower sets to decorate two cards featuring doors from the Art Impressions ‘Door’ set. It was fun to create little scenes around the doors. One ended up being a rustic cabin type door and the other a simple white door at the end of a garden path. I chose frayed burlap distress ink to stamp one of the doors and grey zig clean color real brush marker to ink the other door. I also used the zig markers for the floral and foliage stamps. I learnt on the Art Impressions youtube channel that the best way to stamp the flowers and leaves is to ink them, then stamp several times just slightly offset each time. That way you create more volume and variety in colour. 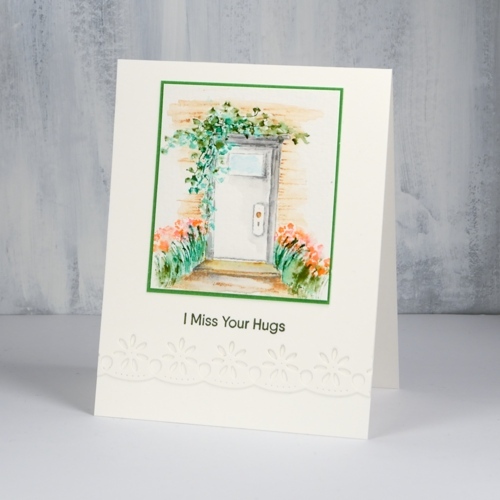 After you have done your stamping (with watersoluble inks like distress and zig clean color) you can blend all the images with a damp brush to create the watercolour look. I added some elements with the zig markers and watercolour pencils to fill out the scenes. front path, bricks and planks around the doors and a hand drawn window. Pop over to the Foiled Fox blog to read about my method in more detail. I really enjoyed playing with these stamps to create my own scenes. The stamps are tiny but you can fill a garden quickly by stamping a mass of flowers and foliage then blending it every so lightly with water. 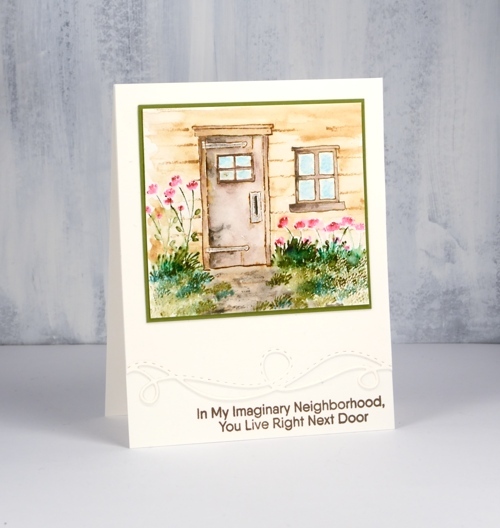 I would love to hear from you in the comments below if you have already done some creating with the Art Impressions watercolour stamps or if you are feeling inspired to give it a try. I will definitely be back with more scenes. Both of these are beautiful, Heather! I have some of these stamps and haven’t played with them nearly enough. You have inspired me! These are beautiful! I love seeing how you have created with the Art Impressions stamps. I love their line of stamps. Hi Cindy, thanks for the encouragement. I have seen Sandy’s AI videos, they are very helpful and inspirational. I have wanted to use these stamps for some time and now I can’t wait. Thank you for the tips. Glad you are feeling inspired. I’m looking forward to pulling these stamps out again along with a little wheel barrow I’ve bought. I am a big admirer of your watercoloring and am a Art Impressions water colorer myself. I love your style on these Stamps. Very inspiring. What beautiful cards. You make it look so easy.